Recently-released from 9 month pre-extradition detention, Mustafa Emre Cabuk, Turkish College Demirel Manager who was accused of having links with terrorist organization, was involved in the State Protection Program on March 1. On February 23 Mustafa Emre Cabuk filed an application to the Prosecutor's Office asking for involvement in the program, adding he and his family started to receive messages of threats through social networks after his release. Turkish citizen’s lawyer, Soso Baratashvili, said his client and all his family are under the state protection now. Baratashvili stated the exact whereabouts of Cabuk and his family is confidential regarding their safety. “Cabuk lives with his family now. His application has been satisfied and he is under state protection, as his family members,” the lawyer stated. Mustafa Emre Cabuk was released from pre-extradition detention of February 20, after the decision of the Court of Appeals of Georgia. However, it does not mean that Cabuk will not be extradited to Turkey, as the trials on his case will continue. 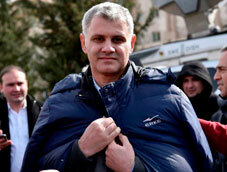 Cabuk, who has been living in Georgia since 2002 and was engaged in education activities, would have been anyway released from the detention on February 23 as his pre-extradition term expired. Turkish college manager was detained on May 24, 2017, after the official visit of Turkish Prime Minister and members of Cabinet to Georgia. He was charged with having links to Fethullah Gulen, former imam and a political figure now living in the United States, who is accused of arranging a military coup attempt in Turkey on 15 July, 2016. Cabuk dismisses any links with terrorists and says that sharing Gulen’s views is not a crime. He also stresses he was a political prisoner. Former teacher says he wants to stay in Georgia with his family and continue educational activities. He hopes the Court will not send him to Turkey. The Ministry of Refugees of Georgia and the Tbilisi Court refused granting refugee status to Cabuk, which would prevent his extradition to Turkey. Moreover, the ministry added they have “guarantees” that Cabuk will be well-treated in the Turkish prison in case of extradition. Non-governmental sector and the opposition do not believe this and demand the refugee status for Cabuk.